Tomorrow, David Cameron will start his second official visit to China as Prime Minister. He will take business leaders from every sector, large and small. This visit takes place soon after the Third Plenum of the 18th Chinese Communist Party Central Committee, and all the reforms that have emerged from it. I am sure reform will feature prominently in the talks between the leaders of our two countries. The two sides will update each other on their respective views and experience of reform. 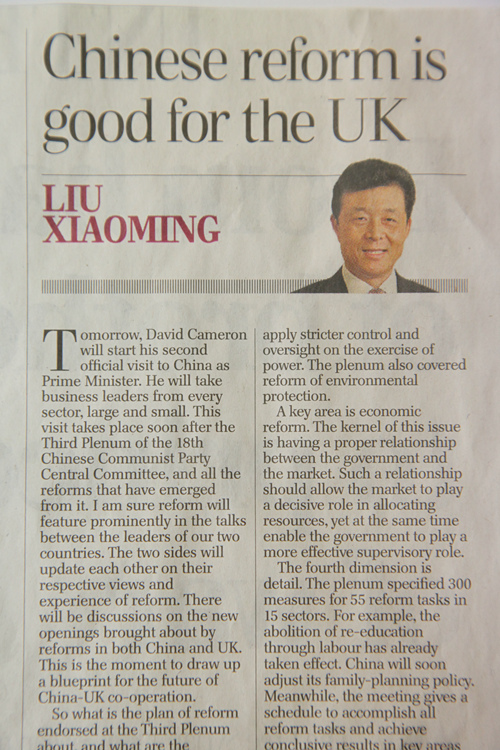 There will be discussions on the new openings brought about by reforms in both China and UK. This is the moment to draw up a blueprint for the future of China-UK co-operation. So what is the plan of reform endorsed at the Third Plenum about, and what are the implications for co-operation? Let’s take a 4-D reading. First, determination. This plenum sent out a clear message. China is determined to free up fixed mindsets, overcome institutional drawbacks, discard outdated ideas and shatter the grip of vested interests. The aim is to promote social fairness and improve welfare. China wants every Chinese person to get a fair share of the fruits of development. Second, design, particularly top-down design. In the early days of China’s reform, Deng Xiaoping famously described China’s reform endeavour as: “crossing the river by feeling the stones”. Now, China’s reform has entered the “deep water”. Any measure that threatens vested interests will meet resistance. This makes top-down design from central government necessary. As a result, the plenum made a statement on combining “top-down design” and “crossing the river by feeling the stones”. The meeting emphasised improved decision-making and building consensus. The newly founded Central Taskforce on Deepening Reform is, in effect, a “headquarters of reform”. The third point is “deployment”. The plenum identified priority areas for deepening reform. The deployments are designed to build a modern and open market economy, transform government functions, deepen the reform of the fiscal and taxation system, and achieve balanced development in rural and urban areas. Arrangements were made to advance socialist democracy, strengthen socialist political institutional building, enforce the rule of law and apply stricter control and oversight on the exercise of power. The plenum also covered reform of environmental protection. A key area is economic reform. The kernel of this issue is having a proper relationship between the government and the market. Such a relationship should allow the market to play a decisive role in allocating resources, yet at the same time enable the government to play a more effective supervisory role. The fourth dimension is detail. The plenum specified 300 measures for 55 reform tasks in 15 sectors. For example, the abolition of re-education through labour has already taken effect. China will soon adjust its family-planning policy. Meanwhile, the meeting gives a schedule to accomplish all reform tasks and achieve conclusive results in key areas by 2020. This means the reform process will be both measured and evaluated. It is fair to say that this Third Plenum has sounded the clarion call for a new wave of reform in China. As the title of an article in The Economist puts it: “China paves the way for reform”. The reforms of the past 35 years have lifted China out of poverty and backwardness and brought it closer to the rest of the world. Now, the second round of reform from this plenum will revitalise the Chinese nation and make the “Chinese Dream” a reality for its 1.3 billion people. Deepening reform will also create new and greater opportunities for China’s relations with the external world, including China-UK co-operation in economic, finance, hi-tech and cultural sectors. We will soon come into the 10th year of the China-UK strategic partnership. As two major countries with global influence, China and Britain have much to offer each other: the spaces for collaboration remain huge. It is estimated that in the next five years, China will invest an additional $500 billion (£306 billion) in other countries, import over $10 trillion (£6 trillion) of products and send 400 million tourists abroad. Among these, Britain should have a good share. We must seize the opportunities and work together to achieve win-win for our two countries and our two peoples.